In the last two weeks, the Appelo house has pretty quickly shifted out of our normal school year routine and into the beginning of the summer routine. My college kids have come home and gone back out to summer jobs. My high school senior finished his dual-enrollment courses and started his summer job on Monday. He’ll officially walk for graduation next week. And for the three that I’m still homeschooling, this means our school year is winding down too. The end of the school year brings such a feeling of DONE. Textbooks are closed and re-shelved, backpacks are cleaned out and lunch boxes washed and put away. 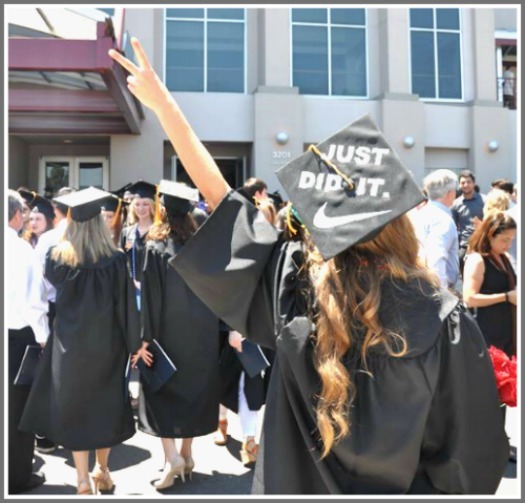 It’s a threshold moment – with the satisfying completion of one school year behind and the expectancy of wide open summer days ahead. Our culture doesn’t have the iconic traditions marking the end of a school year as we have for the first days of school. I do remember one crazy tradition in my high school. On the last day of school after the final bell sounded on our last exam, we students would throw our folders and papers into the air until the hallways were completely littered with our class notes and photocopied worksheets. I cannot imagine how long it took school janitors to clean up and I haven’t encouraged that tradition in our house! But we do have two things we like to do at the end of the school year. First, most years, we eat a special dinner together and I speak to each one of my kids and commend them for specific character and academic growth I saw in them over the year. Dan used to do this and I miss him speaking into each of our kids. 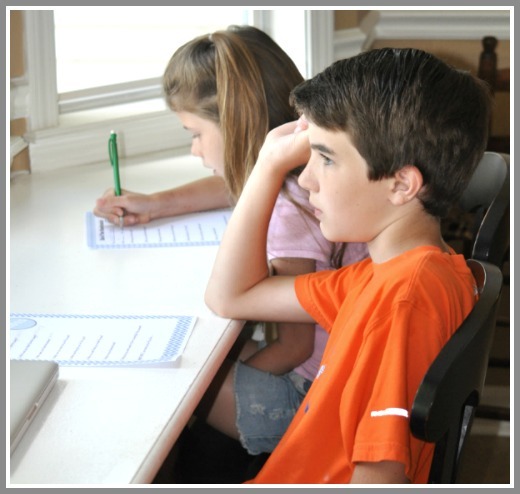 But I love seeing how each of my children receives the best kind of report card – words of affirmation. 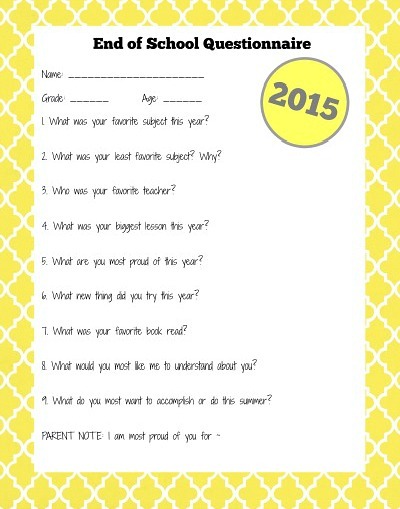 Our second end-of-school-year tradition is a questionnaire. I started this on the fly many years ago, really just to get some feedback. I typed up a few questions, handed it out and was surprised at some of my kids’ answers. Of course I asked about their favorite teacher. (My littles always write me; my olders have other favorites!) And we documented the year and grade and favorite class. 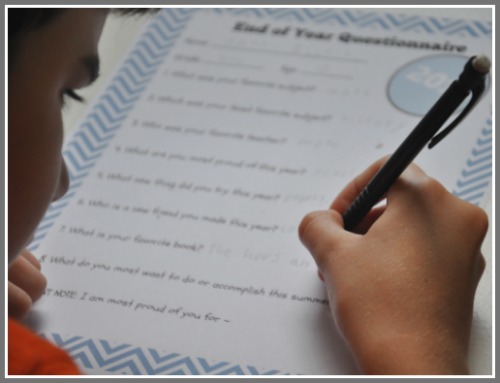 But I added some insightful questions too: “What are you most proud of this year?” and “What would you most like me to understand about you?” I learned some valuable things about my kids in their answers (and sometimes about me and my parenting!). 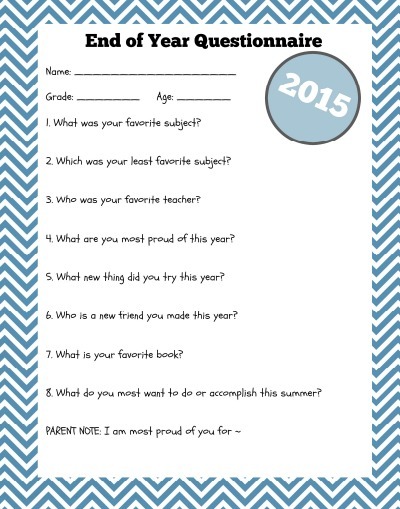 I sat down yesterday and revamped the questionnaire, adding several new questions including these two: “Who is a new friend you made this year?” and “What new thing did you try this year?” There are two versions: one for younger kids for roughly elementary to early middle school age and another for older kids covering roughly tween through graduation. 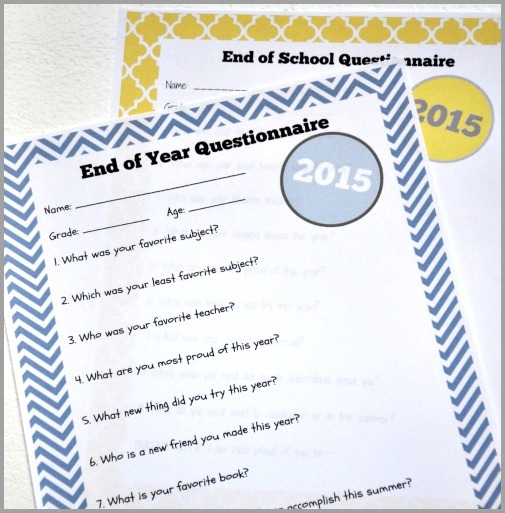 I’m sharing these end-of-school-year questionnaires with you today for your family. These are 8.5 x 11 inch prints (TIP: Set your printer to portrait) Click on the link under the image you want to print OR Pin the image you want and save it for later. Here’s to summer! I hope you enjoy this little end-of-the-year tradition as much as we do! If you’d like encouragement right to your inbox, subscribe here and I’ll send my FREE 100 Days with Christ Bible study and journal. Very nice! Give Seth our congratulstions! And Rachel! Hopping over to see you all now, JES. Thank you for featuring these printables!